A capsule hotel is a must do when looking for an Osaka hotel. A great experience in Osaka accommodation, this style of very unique Japanese architecture can be enjoyed by both men and women (typically, capsule hotels are for men only). This article is about the best capsule hotel I have experienced, Osaka’s largest capsule hotel “Capsule Hotel Asahi Plaza Shinsaibashi”. 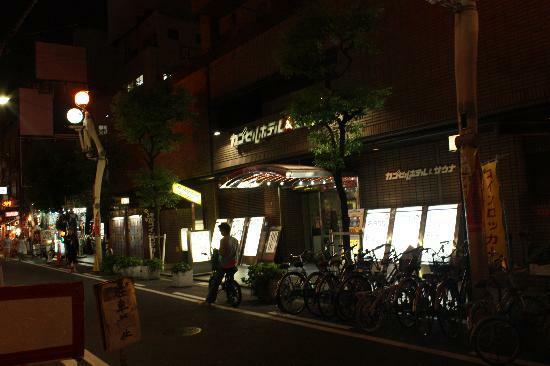 It is the best option for a Dotonbori capsule hotel, Osaka capsule hotel, Shinsaibashi capsule hotel. 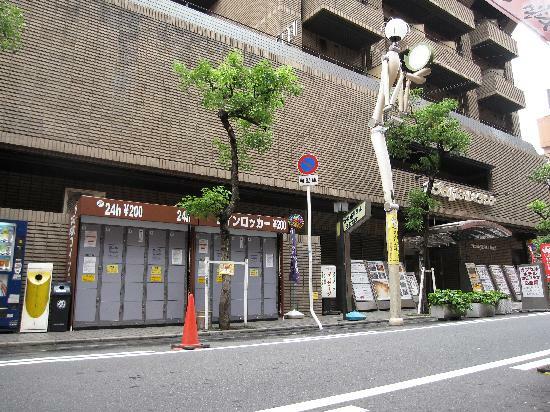 This is a cheap capsule hotel, perfect for the budget Japan traveler, within short walking distance of Osaka shopping (at Namba, Shinaibashi or Dotonburi, Big Step and American Village), Osaka nightlife (gaijin bars like Coolabah in Dotonbori) and very close to a few different JR train stations. The amenities provided here are excellent. Hence why I say this is the best capsule hotel in Japan I have been to. Free computer and internet usage, just ask reception. On each floor there are toilets. On the lowest basement floor are the public baths, with hot and cold baths and showers. If you are with a group, get used to getting naked together, another Japanese norm. Next to the public baths is a sauna, sectioned into hot and very hot. Before entering the baths and sauna, there is a locker room to store your clothes. Also in this room are mirrors, hairdryers, hair oil, toothbrush and toothpaste kits, combs and towels. There are vendis (vending machines) on most floors, where you can by the normal drinks as well as some hot meals and alcohol. On the second floor is a comfortable lounge with games, anime, newspapers and TV for a bit of relaxation. You can even buy shirts, ties and underwear from reception! The inside of the capsule has a comfortable mattress and pillow, all linen, air conditioning (or at least a fan), light, mirror, a TV (insert 100 yen coin for the adult channel) and a bamboo screen for privacy. The Japanese are very considerate so you should do the same, keep quite when you are on the capsule floors. The interior of the standard capsule. We checked in at about midnight, reception is open 24 hours and the reception staff speak enough English to get you checked in and answer basic questions. As is the norm in Japanese culture, take your choose off when you walk through the front door and put on the provided slippers! You will be given a locker key and shoe locker key after you check-in. Lock your shoes in the shoe locker in the lobby. Then follow the signs to the bag lockers, and store your bags. The lockers are large, I fit my very large backpacker style backpack in here. Put on the yukata (Japanese style robe) that is in the locker, this is a requirement in the capsule hotel. You can take some small things with you to your capsule, but note that they aren’t lockable so be careful with valuables. Capsule Hotel Asahi Plaza Shinsaibashi at day. Entrance is on the right. Photo from Trip Advisor. Best option, especially on a JR pass is to walk from JR Namba train station. Google Maps walking directions from JR Namba to the capsule hotel. For more details on prices, bookings and how to get there, see Capsule Hotel Asahiplaza Shinsaibashi’s website (English).